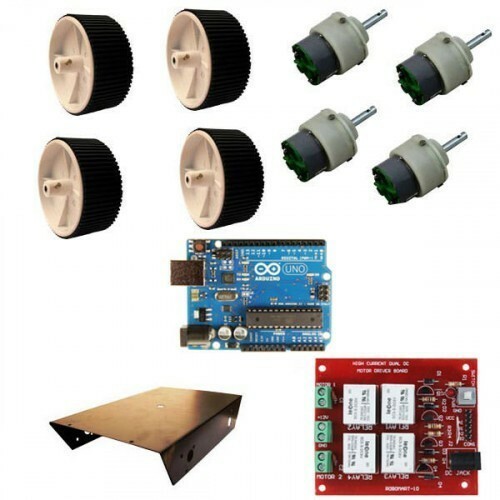 This product consists of an arduino uno, relay based high current motor driver module, and 4 robotic wheel with DC geared high torque motor which can use in any type of robotics purposes for heavy load carrying capacity. These are used in various robotics purposes. 1 x Arduino UNO board. 1 x High current relay based dual dc motor driver module. 4 X DC geared motor. 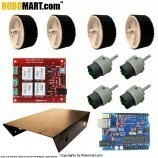 Also Searched as:4 wheel robot, 4 wheel robotic platform, 4 wheel heavy load robot, Arduino robot.